If you dumped every reporter who ever sent a snide message or talked smack in private, there would be nothing but crickets chirping in newsrooms all over America. En su columna Media Equation (2010) sobre la transparencia en el periodismo. The trick of enjoying New York is not to be so busy grinding your way to the center of the earth that you fail to notice the sparkle of the place, a scale and a kind of wonder that puts all human endeavors in their proper place. En sus memorias The Night of the Gun, Carr se encuentra con el dolor de contar su propia historia. Being a journalist, I never feel bad talking to journalism students because it’s a grand, grand caper. You get to leave, go talk to strangers, ask them anything, come back, type up their stories, edit the tape. That’s not gonna retire your loans as quickly as it should, and it’s not going to turn you into a person who’s worried about what kind of car they should buy, but that’s kind of as it should be. I mean, it beats working. El año pasado, en el discurso de apertura del curso en la Graduate School of Journalism de la Universidad de California en Berkeley, David Carr habló sobre la decencia en las futuras generaciones de periodistas. I don’t do corporate portraiture. En el documental Page One: Inside the New York Times. The dirty secret: journalism has always been horrible to get in; you always have to eat so much crap to find a place to stand. I waited tables for seven years, did writing on the side. If you’re gonna get a job that’s a little bit of a caper, that isn’t really a job, that under ideal circumstances you get to at least leave the building and leave your desktop, go out, find people more interesting than you, learn about something, come back and tell other people about it — that should be hard to get into. That should be hard to do. No wonder everybody’s lined up, trying to get into it. It beats working. Durante una entrevista con la Boston University en la que discutió sobre la naturaleza del trabajo de los periodistas y de cómo las tecnologías lo vuelven los medios más interesantes. I’m the kind of person who showers with his shirt on, so walking the beach at Southampton seemed vaguely mysterious — how could so many people have impossibly perfect tans one day into the season? And where did they all stay? Summer shares that cost $20,000 a month? De su artículo You Are Where You Tan sobre un Memorial Day Weekend que pasó con su familia. Where does a junkie’s time go? Mostly in 15-minute increments, like a bug-eyed Tarzan, swinging from hit to hit. For months on end in 1988, I sat inside a house in north Minneapolis, doing coke and listening to Tracy Chapman’s ‘Fast Car’ and finding my own pathetic resonance in the lyrics. ‘Any place is better,’ she sang. ‘Starting from zero, got nothing to lose.’ After shooting or smoking a large dose, there would be the tweaking and a vigil at the front window, pulling up the corner of the blinds to look for the squads I was always convinced were on their way. All day. All night. A frantic kind of boring. End-stage addiction is mostly about waiting for the police, or someone, to come and bury you in your shame. De su artículo sobre la adicción Me and My Girls. We are entering a golden age of journalism. I do think there has been horrible frictional costs, but I think when we look back at what has happened, I look at my backpack that is sitting here, and it contains more journalistic firepower than the entire newsroom that I walked into 30 to 40 years ago. It’s connected to the cloud, I can make digital recordings of everything that I do, I can check in real time if someone is telling me the truth, I have a still camera that takes video that I can upload quickly and seamlessly. De una entrevista con NPR. I now inhabit a life I don’t deserve, but we all walk this earth feeling we are frauds. The trick is to be grateful and hope the caper doesn’t end soon. De su libro The Night of the Gun. Ya está en Paper Papers, pero se lo traigo de nuevo. 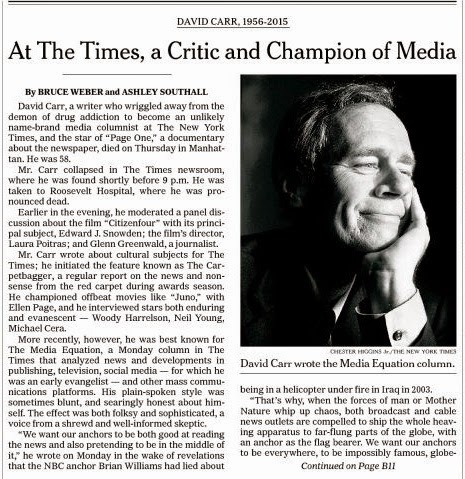 Es el tráiler de Page One, Inside The New York Times, en el que David Carr es la estrella.